As you gain more and more experience at driving a forklift it soon becomes second nature to you. There are many functions and duties that are associated with operating a forklift but there are some main responsibilities that should be considered at all time when driving a forklift. Each of these should be priority. Remember your safety and the safety of others should always come at the very top. To have a safe working environment you have to be aware at all times, this will also drove productivity within the workplace itself. Be aware and pay attention at all times! Always be one step ahead of trouble or situations that may arrive, you should be keeping watch of the floor at all times in order to prevent accidents from occurring. Always have your eyes focused in front on you. You should be constantly looking at your area for any potential risks and hazards. Always keep your hands free of food, drink or electrical devices. This will stop you from becoming distracted and then if something does happen you will have both hands ready to quickly manoeuvre away from the danger. 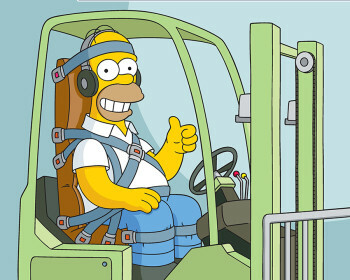 Before you use a forklift make sure that it is in good working order and that it is safe to use. Check that all of the components are working as they should be. Carry out a systematic inspection of each of the parts that can cause forklifts problems. Check on the fuel and voltage levels before you start using the forklift. If you fail to do this it could result in a malfunction of machinery which could result in serious damage to the goods it is carrying or to itself. You should also check the hydraulic oil as this is the oil that allows the forklift to raise and lower the platforms as it carries out its job. If you fail to do this it could result in serious trouble. You should also scan the many different belts and also the pulleys throughout the mechanical system, this will make for a safe operation. You can communicate in many ways including the use of lights and signals that will be able to alert other crew members and there is also the choice of a back up alarm that will warn all others in close range of the forklift that back up is on the way. You must always let others know what’s happening and what you require at all times. Always have constant verbal communication with other crew members. So although visual alarms and signals are great there’s nothing like verbal communication to get your requirements across to others. You should attend forklift safety training sessions to keep up to speed on all the latest safety requirements. You will get up to date info on safety awareness. Brushing up on your skills is always useful and you can do so by attending refresher or booster courses. Well that’s it from me about forklift safety as you can see it is a highly skilled role and one that comes with great responsibility for the safety of yourself and of course others. Safety should always be at the very front of your find when operating a forklift and I hope you’ve gained more info while reading this article.